Have you ever played Pac-Man for an ungodly amount of time, and thought to yourself, “This would be even better if my savings were on the line”? First of all, are you OK? And second of all, the gambling industry is about to grant your wish. Bandai Namco has partnered with Gamblit Gaming to adapt Pac-Man for the casino floor by adding real money betting to a game that already had a reputation for inspiring dangerous quarter-depleting addictions in ‘80s-era arcade-goers. This hit new drug is called Pac-Man Battle Casino, and it looks similar to Pac-Man Battle Royale, a four-player competitive Pac-Man arcade game that came out in 2011. In the Battle Casino version, each player must put down a minimum bet to play. Darion Lowenstein, CMO at Gamblit Gaming, told Compete that the betting floor will be determined by casinos and “will likely range between $2 and $20.” So, probably more than a quarter. You can only place bets beforehand, not during the game, so you can’t heighten the stakes if you realize you’re winning. The prize for the last Pac-Man standing isn’t determined by the bets, though. Instead, it’s all up to a prize wheel that spits out a randomly generated figure per round. Lowenstein told Compete that the game’s meant to be played by “two to four human players only; as always, the CPU controls the ghosts.” He also clarified that it’s all “skill-based,” and the only random element involved is the cash prize. So, maybe Pac-Man champions will bankrupt casinos. But before that happens, it seems like there’s a way for average players to get one over on the house: illicit teamwork. In Pac-Man Battle Royale, Pac-Man can eat other rival Pac-Mans, and everybody has to worry about the ghosts. In the casino version of the game, though, wouldn’t it behoove competitors to team up and counter the ghosts together, then split the final winnings? Am I ruining the fun of gambling with socialism? Money changes people. And it might change Pac-Man. 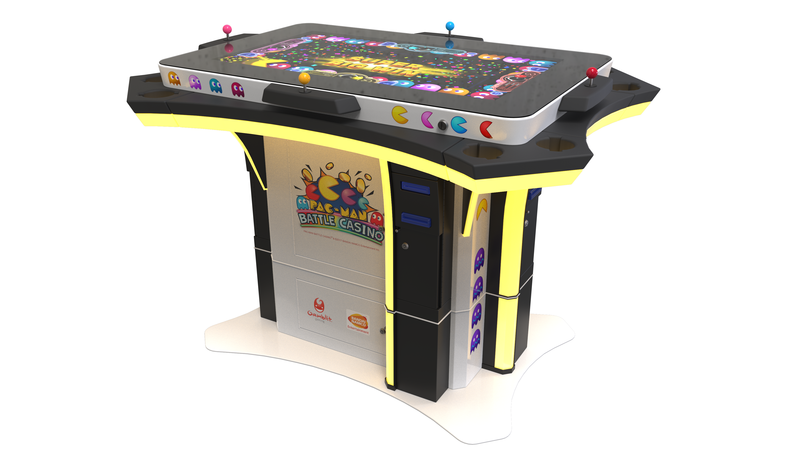 The cabinets debut at the G2E trade show in Las Vegas next week, at which point Pac-Man Battle Casino’s creators will announce which casinos will host the game.